Our soft and absorbent bandana bibs have unique heart shape with soft panel around the baby's neck preventing skin irritation. No scratchy Velcro or harmful PVC backing here. They are made from 100% cotton knitted jersey fabric on the front and very soft absorbent polyester fleece on the back. They are carefully hand-made and hand-printed. Because of the 3 snap buttons used as a closure they will fit newborns and toddlers from 3-36 months. The bibs won't just cover your baby's trendy outfit but enhance it. They look like a very cute and modern scarf or kerchief when worn and your baby will grab lot of attention while wearing them. Besides being trendy modern head turning fashion accessory our bibs are also practical and functional. They are perfect alternative to all traditional drool and dribble catchers such as burp rags and burp cloth and they will keep your precious baby and baby's clothes dry and clean. It will not just prevent your teething baby from the drooling rash but it also saves you lot of time you would have to spend changing and washing your baby's clothes. Each of our contemporary and fresh design patterns was carefully colored and crafted. You can match our bibs with almost every popular baby nursery theme or trendy outfit. This makes our bibs perfect as baby shower, birthday or Christmas gift. 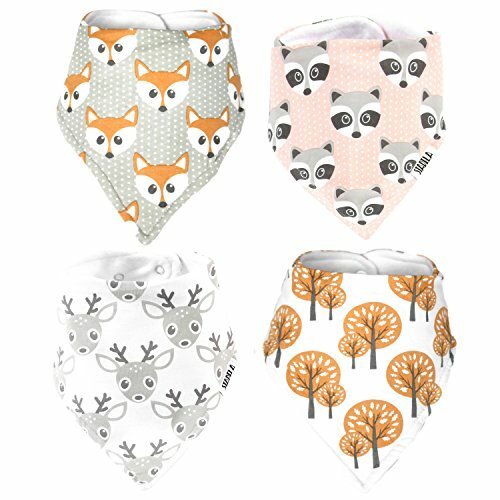 So don't forget to add our bandana bibs to your baby gift registry! Because of the unique modern designs, our bibs are also a great baby prop or accessory for those photography needs. Do you need unisex, baby boy or baby girl bibs? Don't worry we have it all!